1 In the beginning was the Word, and the Word was with God, and the Word was God. He was in the beginning with God. All things came into being through Him, and apart from Him nothing came into being that has come into being. In Him was life, and the life was the Light of men. The Light shines in the darkness, and the darkness did not comprehend it. 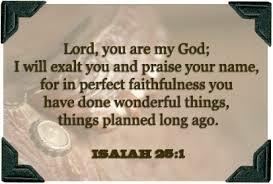 25 Lord, you are my God. I will praise your name. You have been perfectly faithful. You have done wonderful things. You had planned them long ago. 2 You have turned cities into piles of trash. You have pulled down the high walls that were around them. You have destroyed our enemies’ forts. They will never be rebuilt. 3 Powerful nations will honor you. Even sinful people from their cities will have respect for you. 4 Poor people have come to you for safety. You have kept needy people safe when they were in trouble. You have been a place to hide when storms came. You have been a shade from the heat of the sun. They are like a storm beating against a wall. 5 They are like the heat of the desert. You stopped the noisy shouts of our enemies. You kept them from winning the battle over us and singing about it. You are like the shadow of a cloud that cools the earth. a feast for all of the nations. and the finest aged wines will be served. the veil of sadness that covers all of the nations. He will destroy the gloom that is spread over everyone. He is the Lord. We trusted in him. 10 The Lord’s powerful hand will keep Mount Zion safe. But he will walk all over Moab. just as straw is crushed in animal waste. 11 They will try to swim their way out of it. just as a swimmer spreads his hands out to swim. But God will bring down Moab’s pride. None of their skill will help them. 12 He will pull down their high, strong walls. He will bring them down to the ground. He’ll bring them right down to the dust.